Many Alabama skywatchers will be leaving the state to watch the total phase of the upcoming solar eclipse. For people who will be home in Alabama, astronomers at the University of Alabama have collected this information on this eclipse and how to view its partial phases safely. Astronomy students will also be hosting an eclipse viewing on the quad side of Gallalee Hall on campus. For anywhere in the country, local details of timing and eclipse depth can be obtained by clicking on this Google map overlay created by NASA. An adapted overlay for Tennessee and northern Alabama is shown here. 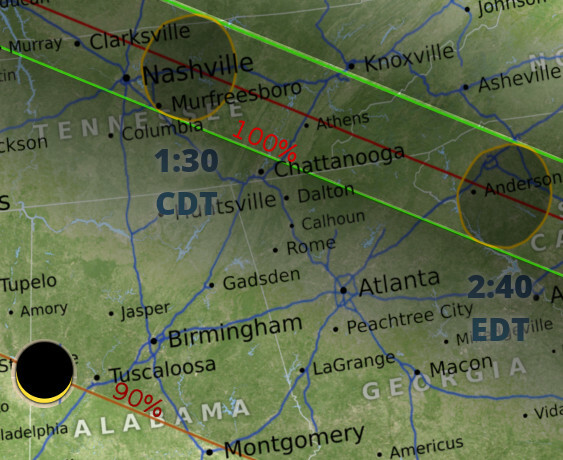 From most of Alabama, the eclipse lasts from about noon to 3 p.m., with deepest eclipse near 1:30 p.m. (Unless marked, times on the Google overlay are in Universal Time, UT; CDT is five hours earlier). Maximum coverage of the Sun by area ranges from 80% near Mobile to 98% in the northeast corner of Alabama, being approximately 90% covered as viewed from Tuscaloosa. 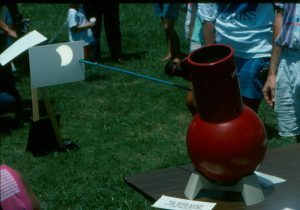 The major ways of viewing a partial solar eclipse safely are pinhole projection, safe solar filters, and projection from a telescope or binoculars. 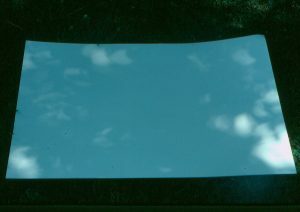 In pinhole projection, sunlight passing through a small hole makes a small image of the Sun on whatever material is used for a screen, which gets larger the farther away the screen is. In much of Alabama, there are trees with enough leaves to form natural pinholes, with the advantage that they are high off the ground. For example, this picture from the UA campus in 1991 shows pinhole images cast by a large oak. In the deepest phases of the partial eclipse this August, these images will be narrow crescents, which can make very striking patterns on the ground. Images of a partial solar eclipse are created by sunlight shining between the leaves of a tree forming a natural pinhole camera. Most telescopes and binoculars can be focused to project a sharp image of the Sun on a sheet behind the eyepieces. Be careful not to allow anyone to put their head behind the eyepiece in this case to avoid possible eye damage (and for that matter, even a finger casually moved close behind the eyepiece can sustain a burn). Telescopes with eyepieces at 90 o to the tube offer easy ways to shade the image for clearer views (as in this picture). Several vendors can provide safe solar filters as thin films in cardboard or plastic mounts. The next similar eclipse will be soon (as such things go), on April 8 of 2024. Its path of totality crosses Mexico, Texas, Arkansas, and then on to the northeast. Maximum solar coverage from Alabama ranges from 73% to 93%. More patient (or younger) sky viewers may keep in mind that the total solar eclipse of August 12, 2045 will encompass Tuscaloosa, Montgomery, and Dothan.